In my previous post I wrote about Rota Palagruzona, oldest European regatta (from Island of Vis, Komiža to Palagruža Island). Old fisherman boats falkusa gajeta were first participants of the same. What is interesting, is salt sardines which those boats carried. Why? 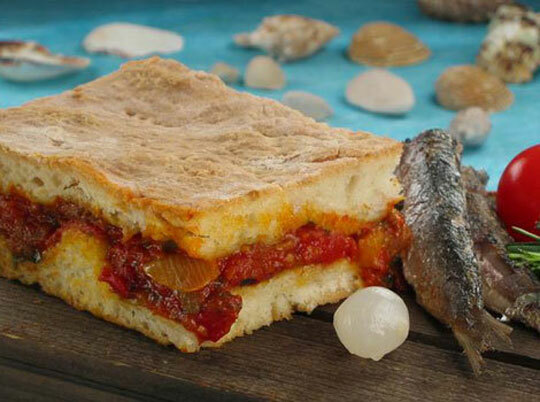 Well, as a true food lover, I adore sardines round cake also called Viška or Komiška pogača. Why or? 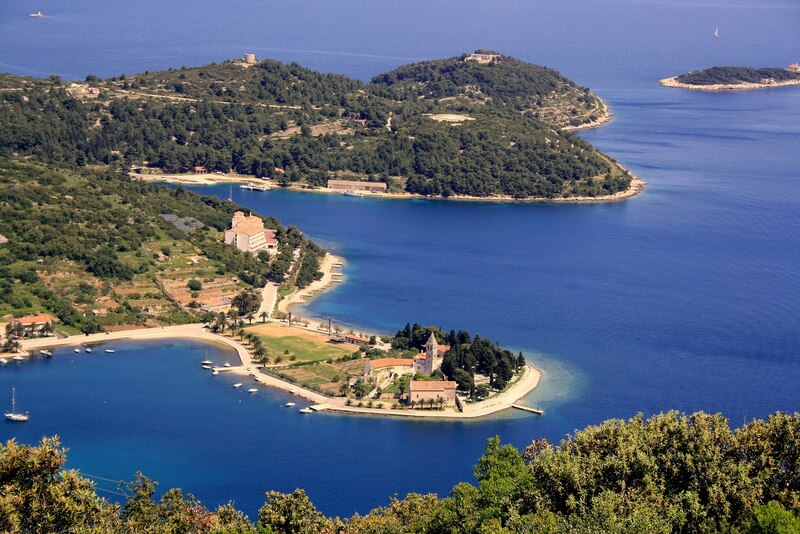 Well, as two biggest places on island Vis, Vis and Komiža always had certain tensions between themselves. That can be seen also in this recipe. Croatian gastronome Veljko Barbieri explored also the story about this specific ‘bread’ from Island Vis (Issa). 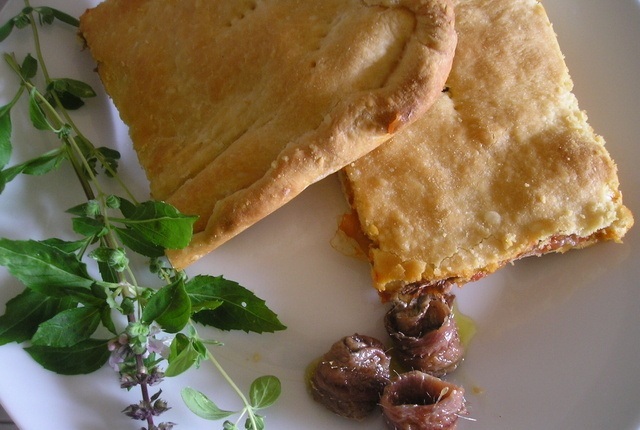 Ancient Greeks were the ones who brought these recipes from Syracuse (Vis also is known as Dionysus Issa). In its older form, this cake had only bread with onion, garlic, petrusimula and fillets of salt fish, mostly sardines. And this is Viška pogača (Issa). But, thanks to Spain and her colonies, Europe as well as south Mediterranean start to use tomato, and tomato sauces. And that is cake from Komiža. We like to call it also Croatian Pizza :). This cake is a simple combination of two layers of bread dough and sardines filling within. Prepare the dough as if you are making bread. Leave it to rest until it doubles in volume. In the meantime, slice the onions and sauté them in olive oil. Add tomatoes, pepper and parsley and cook over low heat for 15 minutes. Leave the sauce to cool down! When the dough is ready separate it in two unequal pieces: one slightly bigger, one slightly smaller. Roll out the bigger pieces and lay them on a large baking tray (35 x 40 cm) that you previously oiled with olive oil. The dough should be larger than the tray by 2 cm. 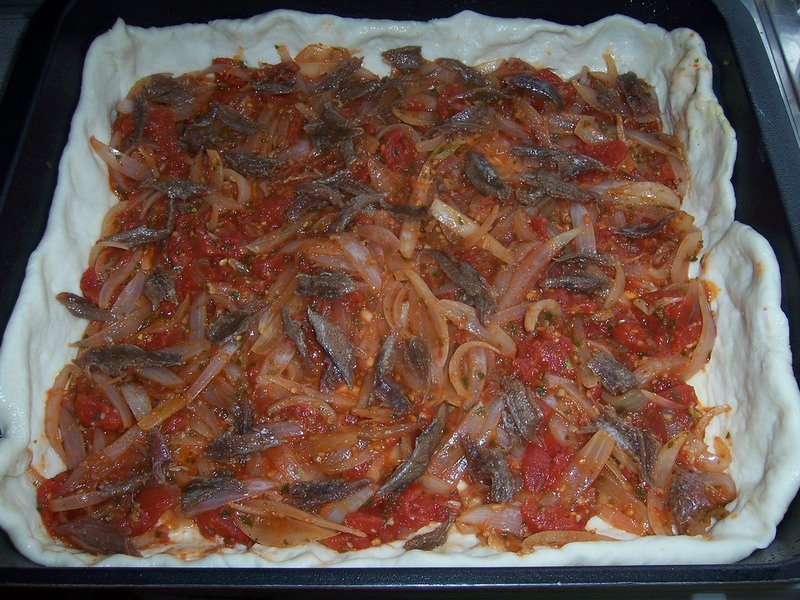 Spread the sauce over the dough and arrange the fillets on top. Roll out the smaller piece; put it over the larger one. Press the top layer of dough and the bottom layer together. Use a fork to prick the whole pogača (every few centimetres) so that it doesn’t swell during baking. Oil the pogača with olive oil and leave it to rest for another 10 minutes. Bake on 180 C (350 Fahrenheit) for 35 min, until it gets a nice yellow colour. You can increase the temperature to 200 C (400 Fahrenheit) in the last 15 minutes. Pull the bread from the oven and brush it again with olive oil. Cover with a cloth and leave to rest for 20 minutes. Cut in rectangular pieces and serve. Yum! My favourite breakfast lunch and dinner when on Vis with my family in the european summers. Will try and make it but sure it won’t taste as good as it does sitting under a tree by the salty blue water. Thank you for recipe!